Please Note: Land Price does not include airfare, departure or arrival transfers, airline taxes and fuel surcharges. Call or submit a quote to get our Low Prices! Gate 1 offers the flexibility of paying for your vacation by check. Save 5% off of your remaining balance when the final payment is made by check. Gate 1 offers the flexibility of paying for your vacation by credit card or check. Choose check for your final payment to save 5% off of your remaining balance. Full details will be sent with your invoice. Traveling with friends and family is rewarding - and Gate1 is making it even more rewarding with their Friends & Family program. Bring 10 companions on your tour or cruise, and the 11th traveler will earn free land services! As a past customer, when you refer a friend you both benefit. Not only will your friend receive $50 off their first escorted tour or river cruise booking, but when you book your next new tour or cruise you will also receive $50 off. To be eligible for this incentive, the referring customer must have previously traveled with Gate1, and the passenger receiving the referral must be a new client. Only valid on escorted tours and river cruises. Only one person per room may earn a credit. The new traveling passenger must be booking their first reservation with Gate 1 Travel, Discovery Tours or Signature Collection. The referrer's next trip must be booked within 12 months of earning the credit. Not valid on independent vacations, voucher bookings or Group reservations. Additional restrictions may apply. 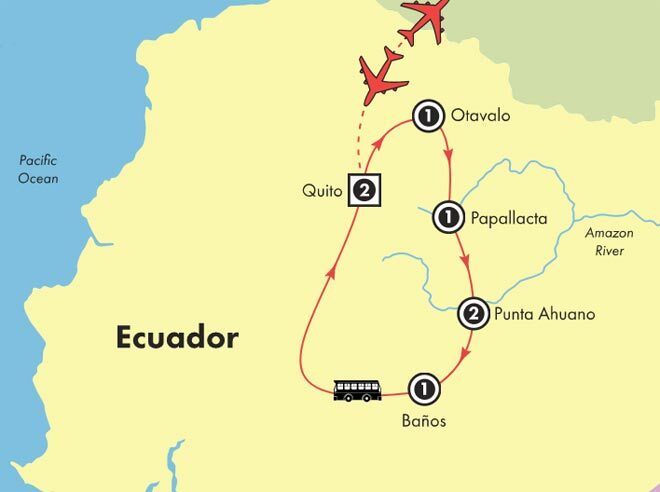 This 8 day "on-the-go" program features the highlights of Ecuador in an active itinerary which includes several walking tours as well as some early starts and long days. Due to the high elevation, travel in the Ecuadorian Andes may cause some passengers to experience the temporary effects of altitude sickness. If you have any concerns about traveling to higher than your accustomed elevation, please consult your healthcare provider. Some departure dates may be offered from an alternate nearby airport. Check flight itinerary options when booking. Some flights depart shortly after midnight in the very early morning of Day 8 and will require a transfer on Day 7. Transfers depart the hotel approximately 4 hours prior to flight time. Jan 28, Feb 25, Mar 25, Apr 22, May 3, May 20, May 24, Jun 17, Jul 15, Jul 19, Aug 2, Aug 12, Sep 9, Oct 7, Nov 4, Nov 25, and Dec 16 departures will be accommodated at the Puertolago Country Inn in Otavalo. This deluxe hotel is located in the heart of Ecuador's capital with easy access to the financial district and the colonial sector of the city. This first class hotel is located on the shore of San Pablo Lake. This first class hotel overlooks San Pablo Lake. This first class hotel, known for its thermal baths, is located on the banks of the Papallacta river. This tourist class lodge is located in the Ecuadorian Amazon in a lush tropical and tranquil setting on the banks of the Napo River. This tourist class hotel is located at the Llanganates National Park in the Patate Valley with picturesque views of the volcano. Note: AffordableTours.com is a travel agent for Gate1. All prices, itineraries, accommodations and dates are subject to change without notice and at any time by the tour operators. All prices are USD per person and based on double occupancy. Availability is limited and must be reconfirmed at time of booking. Please call us toll free at 1-800-935-2620 to confirm availability and current pricing on all our discounted specials. The prices on this website are not guaranteed until a deposit has been made. We are not responsible for errors, omissions, or changes in these prices until a booking has been confirmed by one of our agents. Some land prices may include an internal air component and discounts will not be offered on the internal air component. Discounts will not be offered on packages with a land price of less than $500.